Over the last couple of years I have been very busy with main two things... (1) Running my music company, Lynne Publishing, and the stock music label Shockwave-Sound.com, and (2) Playing tennis and being active in my local tennis club as both the team captain of the veteran's tennis players team, a member of the board of directors of the club, an assistant coach and an arranger/organizer of events, tournaments, series etc. 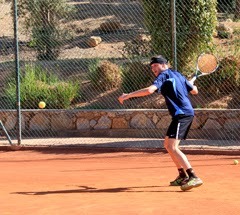 The photo on the right shows me on the tennis court earlier this year. Those are the two things that take up nearly all of my time these days, and I'm really enjoying it. The music company is going well; I have about 350 composers from all over the world who have their music sold and licensed via my company. I released a new album of my own personal music also, a couple of months ago. The album is called "Traveller", and it was my first digital only release, meaning that the album is released only as a downloadable album, and no actual physical CD's were made. For this album I tried not to make it very "epic" or difficult. It has been a problem for me in the past that I've made some very big projects, and the next time I sat down to write music, I felt there was a huge mountain in front of me because I had to "surpass" my previous release, to make it even bigger, even more epic, even more impressive. So I decided to try to drop that feeling, and instead go back to basics and just create some nice, chilled-out tunes with an ethnic / world / fantasy kind of feel. I also deliberately wanted to make it a fairly short album, not one of those huge 79-minute epics. :-). Anyway, I hope you like how it turned out. I will try to write another blog post already tomorrow, about some new releases of old music that I composed on the Commodore Amiga computer already back in 1988-1995. More about that tomorrow. Hey Bjørn ! Great work on "Traveller" ! I love the eerie / mysterious mood it sets. It's very varied, never boring and definitely different from your previous releases. Great surprise, thanks :) Maybe I'll try to write a complete review when I have some time. I was at first disappointed to see no physical CD release, but, on second thought, it's probably better as less risk is taken and you can focus on actual work ! Anyway, nowadays, we all have some kind of digital device to play it on. Amiga MODs were digital, after all !! 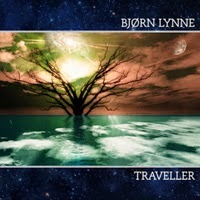 Get a free Bjorn Lynne CD ! New music track "Outback Ramble"